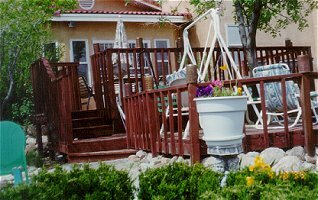 Enchanted Vista is located on one acre of beautiful gardens, fish pond and the very best views of Albuquerque. 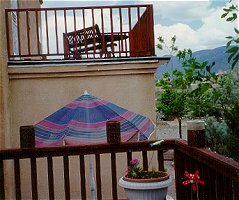 The breathtaking views of the Sandia Mountains and sunsets is an enchanting and peacefull experience. About 25 minutes from the airport and a short 40 minute drive to Santa Fe. All spacious suites have private parking by fireplace entrances and private baths. The Santa Fe Suite has a marble whirlpool tub for two. Very Romantic. All have refrig, micro, TV, phone and eating areas. Perfect for the longer stay. Take a day trip to one of the many nearby Pueblos or made a day of old town, Museums, "The Tram"(longest in the world) then come home to a glass of wine or sip a cup of coffee. on your private veranda as you watch the wildlife frolic on the grounds about you. Coninental plus breakfast at your convience. A truley enchanting Bed and Breakfast! This and other Albuquerque Bed and Breakfast Inns can be found here in The Register.